Error – typescript – node_modules\@types\jQuery\index.d.ts(40,45): error TS1005: ‘,’ expected. Why did this happen? I’ve literally only written one import statement! After some investigation, I found the cause of the issue and, fortunately, a solution. So, the SharePoint Framework is using TypeScript 2.2.2. What’s the big deal? This mismatch is causing all the build errors for this dependency! ARG!! This fix is actually pretty simple once you know the problem. All you need to do is use a version of the @types/jQuery package that supports TypeScript 2.2.2. Now when you run gulp serve everything should work as expected! In my previous post, Embedded Chromium in WinForms, I walked you through creating a simple WinForms application that will load local html resources into an embedded Chromium browser using CefSharp. 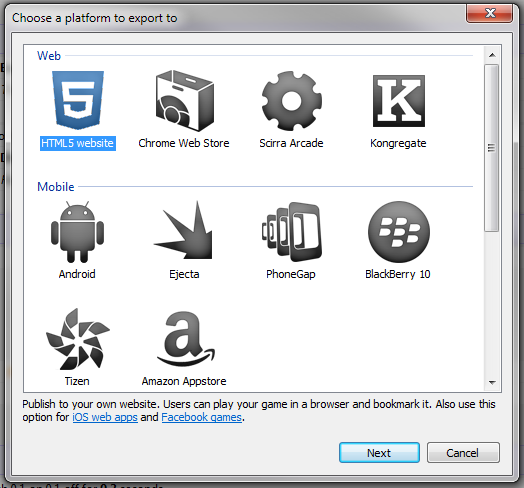 This article will build on that application to show you how to host Construct 2 games inside your WinForms application. Additionally, I will show you how to use my Construct 2 jsMessage plugin to communicate directly from .NET code to your running game. 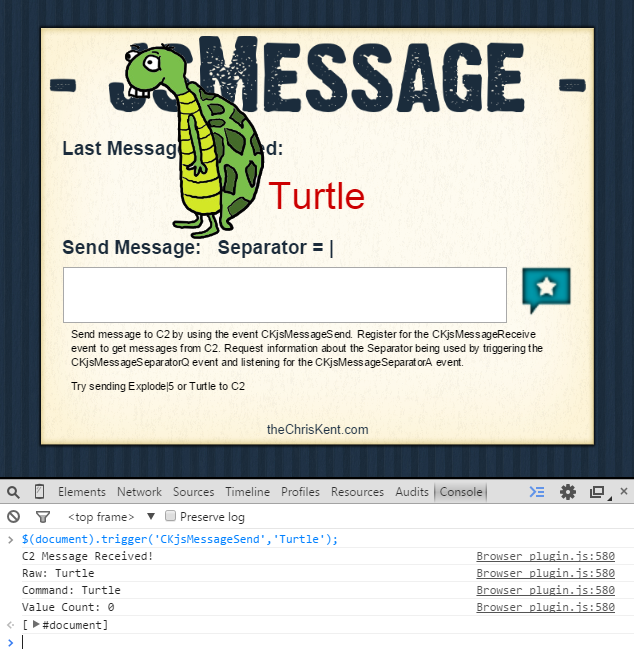 For this article I will be using the jsMessageTest Basic game available on the jsMessage CodePlex site as an example download. You can use either the paid or free versions of Construct 2 to create the resources but you will need to install the jsMessage plugin. 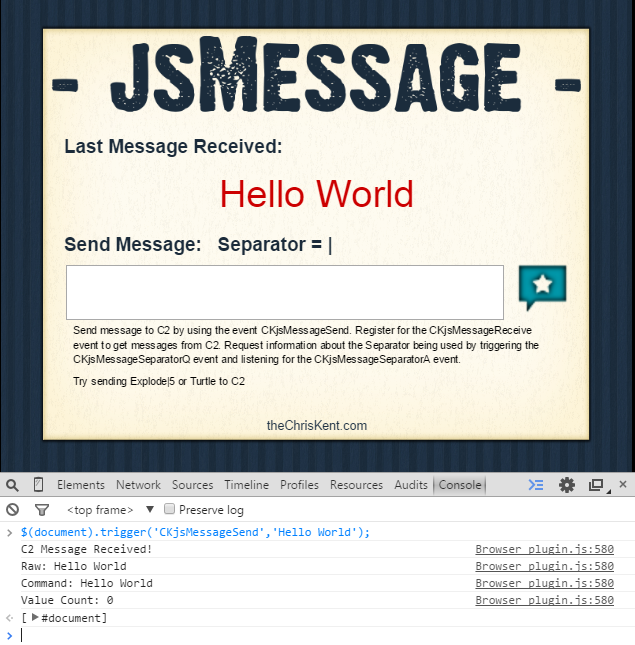 More details about this plugin and about the example game we’ll be using can be found in my posts, Introducing jsMessage for Construct 2 and jsMessage Basic Example. You can also just use your own game or one of the many sample games that comes with Construct 2. 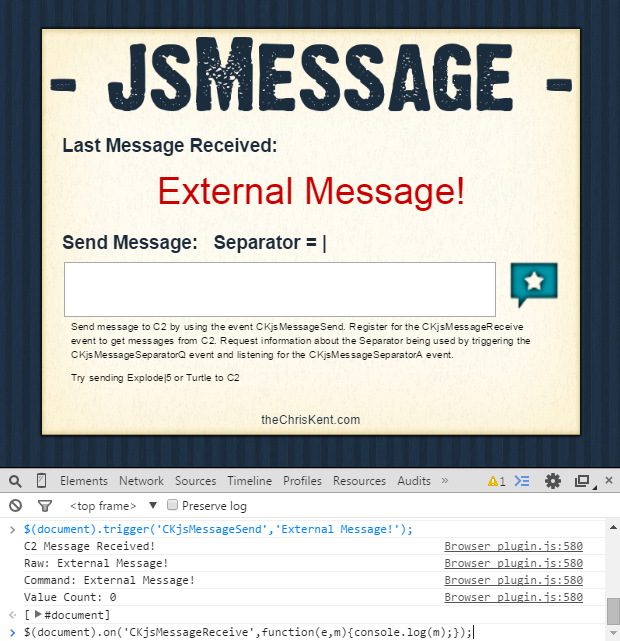 However, you won’t be able to follow along with the Sending/Receiving messages section of this post without the jsMessage plugin. Choose Normal Style in the template options and click Export. Go ahead and run the application. If the game shows up for you, fantastic! This “game” doesn’t have much to offer without some additional plumbing (see below) but it is fully interactive. If you were to switch it out for a platformer game or something similar you would see that all the key presses, clicks, etc. are all passed just like you’d expect! 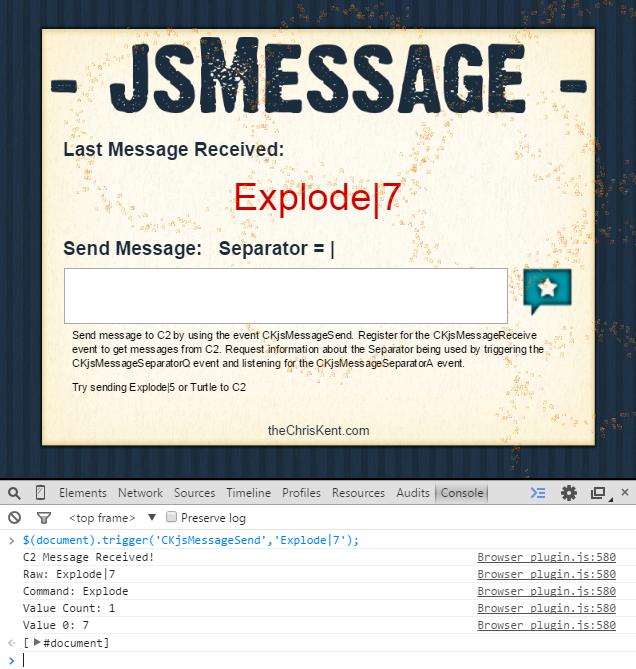 The jsMessageTest Basic game was built with the jsMessage plugin. This plugin allows the game to respond to jQuery events and to trigger events of its own. You can find a lot more detail about how this works with this game in my post, jsMessage Basic Example. In the Click EventHandler (lines 49-54) we’re just making sure there is a message to send, calling the SendMessage sub and clearing the txtMessageToSend box. This is not particularly exciting code but it should illustrate what is possible. It should also look somewhat familiar if you followed the steps to make our LogDialogHandler object in the last article. In our constructor (lines 5-7) we accept an Action(Of String) which we will use to handle our logging. We store this Action into our private logReceiver object (line 6) so that we can use it later. 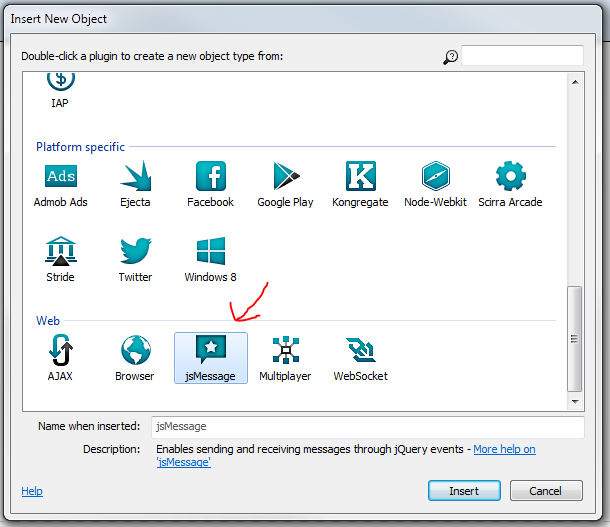 Now we just need to tell jQuery to call this function when receiving a message from the Construct 2 game. We do this by using the ExecuteScriptAsync method we used earlier when sending messages. The IsLoadingChanged event provides us with a helpful event argument that tells us if the Browser is loading or not. We verify that it is no longer loading then inject our JS event handler and remove the .NET event handler from the IsLoadingChanged event (since we only need to call this once). You now have all the basic plumbing in place to host a Construct 2 game directly in your WinForms application and to be able to send and receive messages directly from the game! This opens up a wide range of possible applications. I wrote all of this for an integrated project I’m working on, but I hope you find it helpful too! 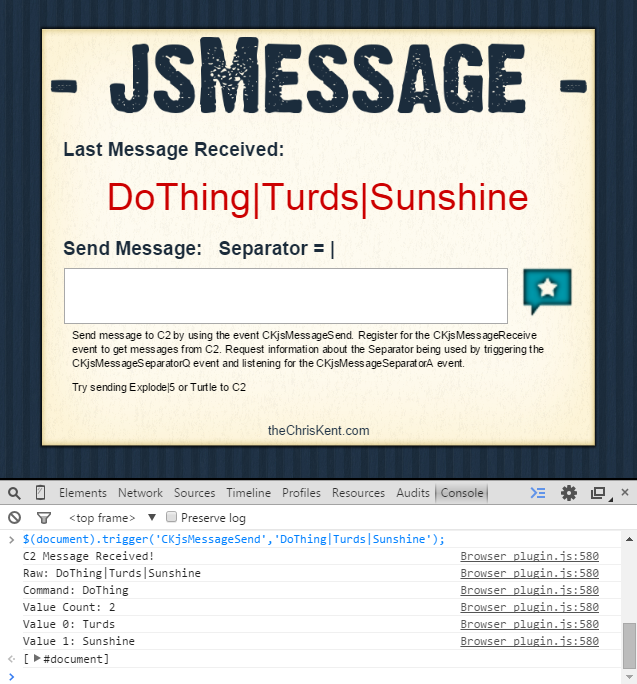 In my last post, Introducing jsMessage for Construct 2, I gave a brief overview of my C2 Plugin jsMessage. 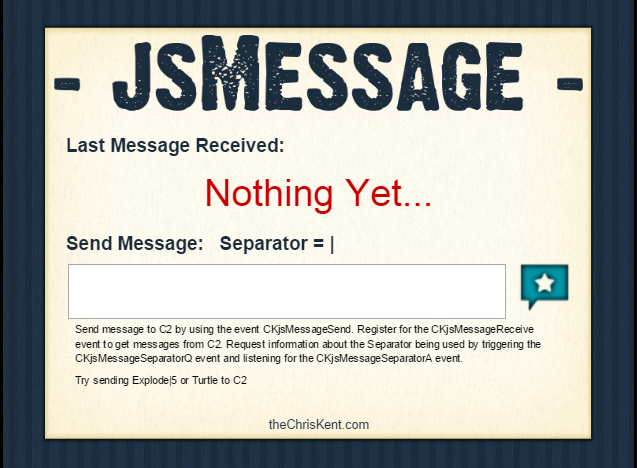 jsMessage enables sending and receiving messages in Construct 2 through jQuery events. You can read more in that post, but the basic idea is the ability to communicate to a Construct 2 game through the Browser. The license is free for everybody and attribution isn’t required. In this post, I’m going to walk through the jsMessageTest Basic game to show you exactly how it works. You can also download it over on CodePlex if you’d like to follow along. When you first run the project not much is going to happen. You’ll see a big red message that says “Nothing Yet…” – once you’ve successfully sent a message the contents will be displayed here. Using the Log in console action of the built-in Browser object, we output information about the received message. 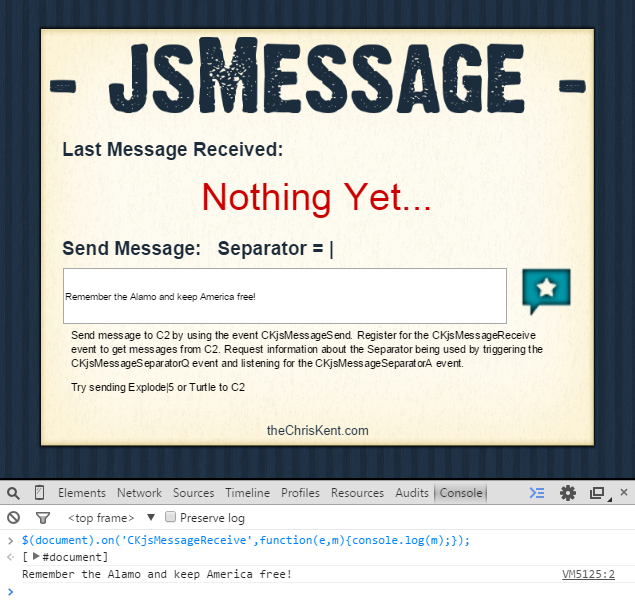 The jsMessage.MessageRaw expression provides the full message string. 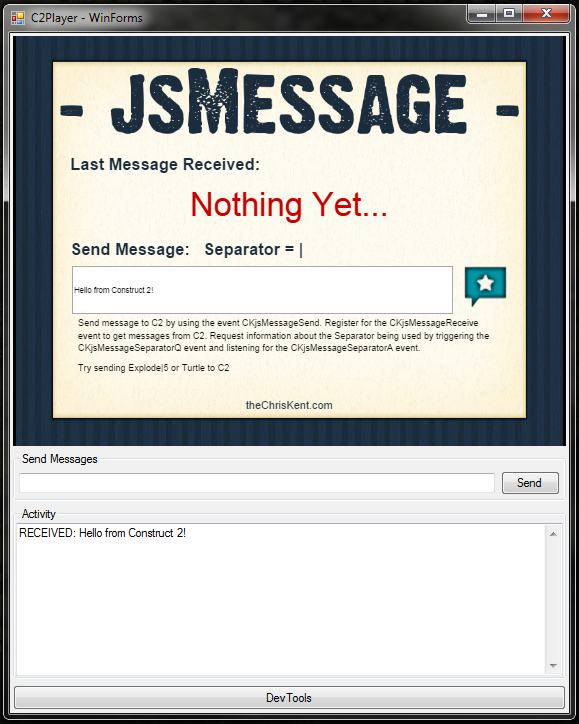 The jsMessage.Command expression provides only the first part of the message before any values (known as the command). 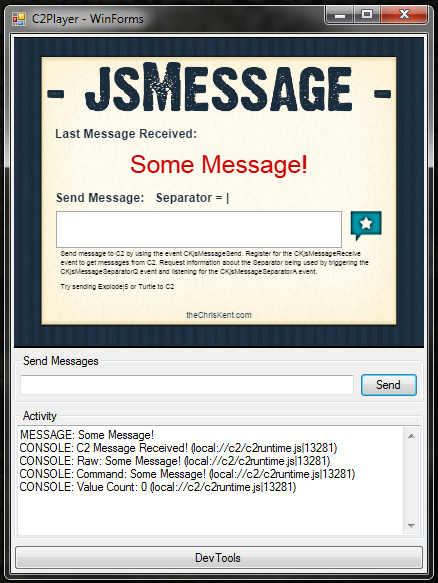 The jsMessage.ValueCount provides the total count of values passed (additional strings after the command separated by the Value Separator Property). Finally, there’s a For Loop that outputs each of the message’s values (if there were any) by using the jsMessage.Value() expression. You can see the txtReceived object had its text set to the message and the console has all the log messages we expected (Raw & Command are equal in this case and the Value Count is 0). You’ll see the txtReceived object gets the full message just like before, but if you look in the console you’ll see some differences. We can now see our Command is DoThing and that we have 2 values: Value 0 is Turds and Value 1 is Sunshine. Of course, we are assuming the use of the default separator (The separator is customizable so it’s always a good idea to use the Separator Events to determine what that is before sending/receiving messages on the client). We are listening for the command, “Turtle”. When it’s received we move a turtle sprite across the screen using a Bullet behavior (There are also a couple of conditions to reset the turtle once it leaves the screen). Look at that cute turtle! LOOK AT IT! You can see everything works just like any standard condition (Note that the console also provides us all the extra information because both the Command “Turtle” Received and Message Received conditions are firing). We are listening for the command, “Explode”, but we’ve added some additional conditions to ensure that there is an included value (jsMessage.ValueCount = 1) and that that value is an integer greater than 0 (int(jsMessage.Value(0)) > 0). Once the above conditions are met,we use a For Loop to create the number of explosions (particle objects) as specified by the passed value (with a max of 10 cause let’s not get crazy!). 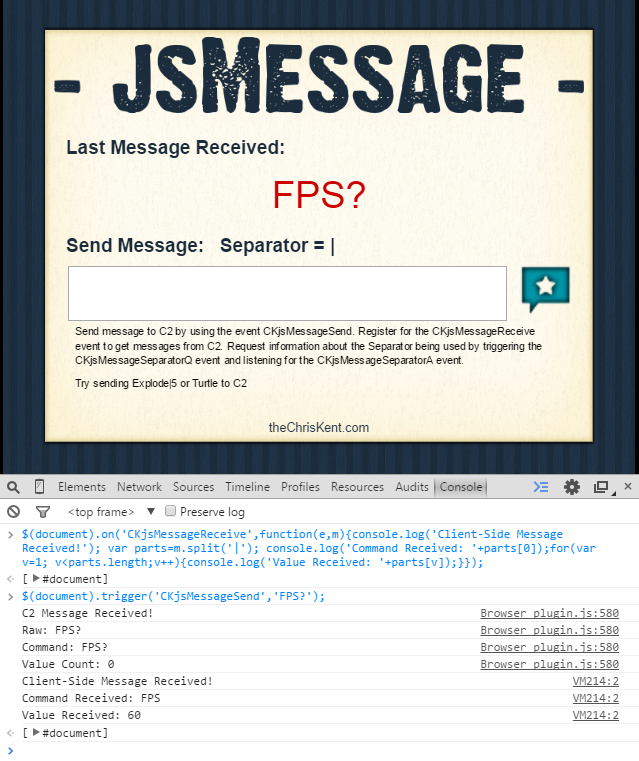 When we get the command, “FPS?”, we use the Send Message action to send a custom message built by concatenating a command, “FPS”, the separator using the jsMessage.Separator expression and the C2 value, fps. We could have just typed the default separator but since this is a customizable property it’s always better to use the jsMessage.Separator expression. When we send the “FPS?” message to the game it responds with the fps information. Our client-side response just outputs the C2 message right back to the console. I’ve hard-coded the default separator in this example, but you’ll want to use the Separator Events beforehand to ensure you know what the separator is before receiving/sending messages from the client. Be sure to check out the full documentation for more details. Stay tuned for an upcoming post where I’ll show you an actual use case for this plugin. WOWEE! 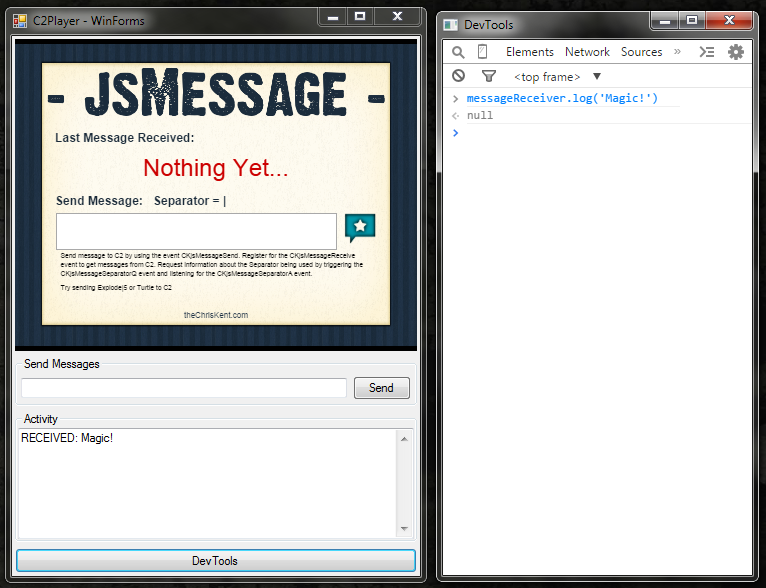 jsMessage is a Construct 2 plugin that enables sending and receiving messages through jQuery events. I’ve just released it over on CodePlex where you can download it and a sample game to show you how to use it. You can use it in the free edition as well as all paid editions. The license is totally open so feel free to use it in your commercial or personal projects, etc. No attribution necessary (although always appreciated). You can find out how to install it by checking out the documentation on CodePlex (It’s a c2addon, so just drag and drop). jsMessage is a cool little plugin that adds 2 conditions (Message Received, Command Received), 1 Action (Send Message), 5 Expressions (Message Raw, ValueCount, Command, Value, Separator) and 1 Property (Value Separator). You can use these to respond to external messages coming through the browser. There are several other plugins that allow network communication and generally this is the way you’re going to want to go. If you are trying to have games talk to each other or download things, etc. – this is not the plugin for you. The only way to communicate to the game using this plugin is to trigger jQuery events and to register to receive them as well. I had a specific need to communicate to a running game in a browser I control. I will be demonstrating this technique in an upcoming post and hopefully it will make more sense then. However, there are lots of other uses and I’m excited to see what other people end up using it for. There is some more in-depth documentation available on the CodePlex site and I’ll be posting an elaborate walkthough using the basic example game in an upcoming post. In the meantime, here’s an overview. This will trigger both the Message Received and Command Received conditions in your game. Command Received allows you to respond to a specific phrase. Message Received is more general and you’ll have to do some comparisons to see if it was the message you were looking for. In other words, register to respond to the CKjsMessageSeparatorA event and then trigger the CKjsMessageSeparatorQ event to have the game respond. Within the Message Received or Command Received condition you can get a count of the values sent with the jsMessage.ValueCount expression and then request those values using the jsMessage.Value(0) expression. 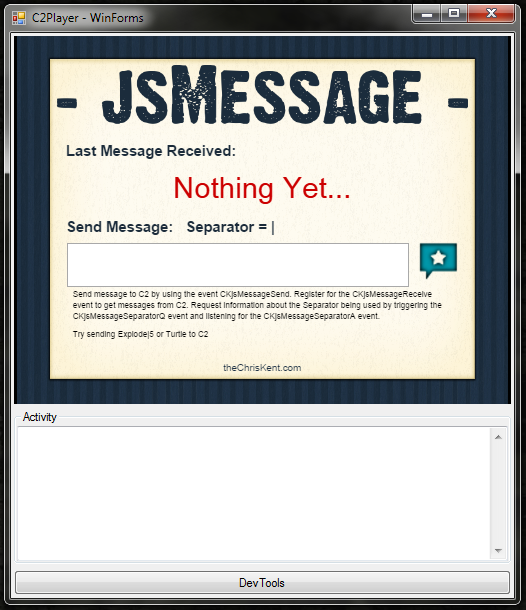 There are also expressions to get the raw message (jsMessage.MessageRaw), just the command (jsMessage.Command) and even the configured separator (jsMessage.Separator). This will simply print out whatever message was sent directly to the console. That’s the basic overview of the plugin. If you have a need for this kind of interaction then go download it and check out the example “game” (it’s free!). In my next post we’ll make this a little clearer by walking through the example game in detail. All it does is perform a temporary wrap around whatever jQuery Element you pass in, grab it’s parent (which is now the Div we just wrapped it in) and grab the parent’s inner HTML (which is of course the full HTML of our object). Then we just unwrap it in line 3 and return the string in line 4. It’s quick and easy and I use it in development all the time. Hopefully it helps you too. Marc D Anderson’s SPServices (jQuery for SharePoint Web Services) can save you a ton of time and make your SharePoint sites more responsive and dynamic with very little effort. Nintex can really beef up your workflows and/or your forms. So it makes a lot of sense to bring these together! Recently I was tasked with pulling some user profile information to display on a Nintex Form that was being used to launch a site workflow. Unfortunately, there is no way to run workflow code before showing the initial form; so all of those great Nintex Workflow Actions were unavailable to me. Fortunately, SPServices allows easy querying of the User Profile Service directly from client side script. 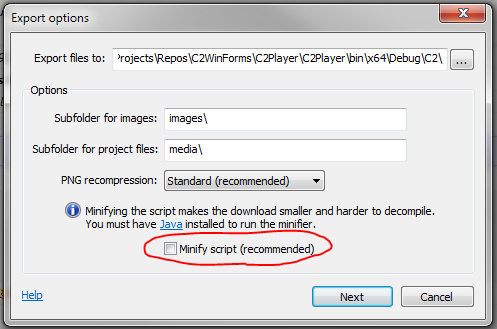 Nintex Forms uses a copy of the jQuery library that you can access through NWF$. So just adding SPServices to your form’s page won’t work, but since jQuery is already there it’s fairly simple to get it all hooked up. Open the F12 Developer tools and preview your form. 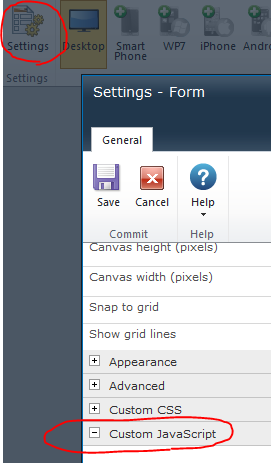 In the Console you should see the version of jQuery being used by Nintex Forms. For us it was 1.6.1. So we should be fine using the latest version of SPServices. Then just upload it somewhere in your site collection (The Style Library is generally the best place). Press Save and that’s it! You can now access SPServices to do whatever fancy magic you need! Then just make sure those F12 developer tools are open and preview the form again. You’ll see the version of SPServices logged out to the console.